Sussex captain Luke Wright has a special milestone in his sights as he prepares for Sussex Sharks’ Vitality Blast quarter-final against Durham Jets on Friday. The 33-year-old became the first English batsman to pass 7,000 runs in the format when he scored 74 as the Sharks beat Middlesex at Hove last week to secure a last-eight place for the first time since 2015. But Wright, who along with Will Beer is the only surviving member of the only Sussex team to win the T20 title, in 2009, is aware that he could play his 300th T20 game if the Sharks reach the final. Sussex made the long trip to the north-east immediately after beating Derbyshire in the County Championship on Wednesday to give them as much preparation time as possible, breaking the journey in Leicester on Wednesday night. And after winning three games in four days to seal third place in the South Group there is a strong sense of a team, whom many regarded as favourites to win the Blast, hitting their straps at the right time. Playing away from home won’t worry them either after they won five group games on the road. Wright added: “We’ve got some momentum now. In terms of the quarter-finals it’s just nice to be in the mix. We’ve got a chance but there are some great teams in the north group although we’re not bad ourselves! Although Sussex will again be without Rashid Khan because of Afghanistan commitments in Ireland, they have a ready-made replacement in Beer, the only Sussex bowler to take more than 100 T20 wickets. Beer had been restricted to just two games before last Friday but with Rashid absent he returned against Middlesex to claim two wickets. Not that his performance surprised his captain. “Will hasn’t played much so there was pressure on him but he’s very experienced in this format and he’s a big-game player," said Wright. "He has only missed out because we had the world’s best T20 bowler available but when he was here Rashid was great with Will. 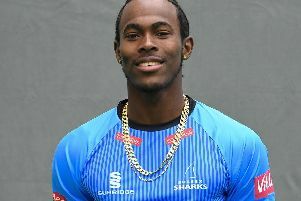 Rashid could return if Sussex reach Finals Day on September 15 and Sussex are hoping he will commit himself long-term to the county after a successful stint at Hove. “I was playing when Mushtaq Ahmed was here and it’s the same feeling, that buzz that the game hasn’t really started until he’s come on,” said Wright. England's Ben Stokes had been left out of the Durham squad but has now been added to the squad as a batsman.